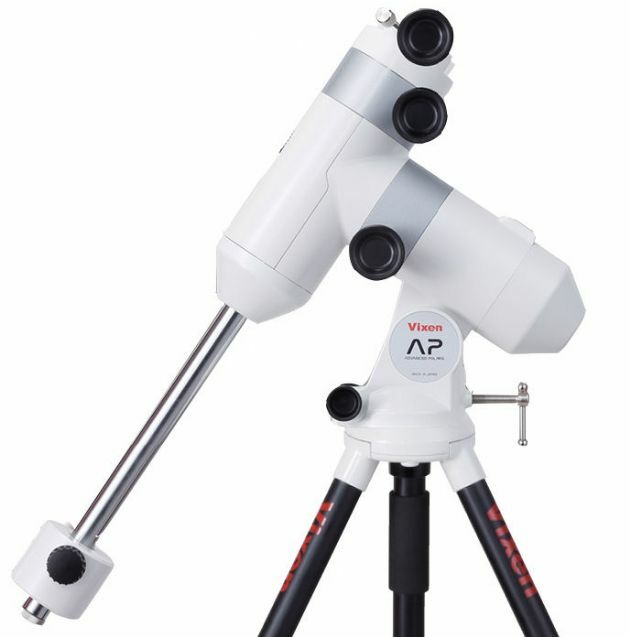 The Advanced Polaris (abbreviated as AP) Mount is ideally suited to beginners who want to become familiar with equatorial mounts or experienced observers who want a simple grab and go mount. The AP mount securely supports your telescope optical tube for comfortable observing. With its friction control mechanism, the mount can be quickly moved to your target object. A wide selection of optional accessories are available for the AP mount to meet your observation needs. The AP mount consists of several modules or units that are joined together to make a stylish, highly portable German equatorial mount of excellent quality. With the available R.A motor module, complete with the Star Book One controller, it is easy to accurately track celestial objects. There are two basic versions of the AP mount from which to choose. The basic AP mount comes standard with both the R.A and DEC manual slow motion control modules for manual operation. The AP-SM mount employs the R.A motor module for celestial tracking in place of the R.A manual slow motion control module and it comes standard with Star Book One. The upgrading will be completed with an addition of the optionally available DEC motor module.